Westar Energy installing customized covers at Manhattan substation to help prevent wildlife-related power outages. Topeka, Kan., Sept. 23, 2013 — They come unannounced. Some may be looking for shelter; others are looking for a meal. They make their way through fences and mazes of equipment, unaware of the potential danger that exists within an electric substation. When birds, snakes, raccoons, squirrels and other wildlife come into contact with energized and grounded parts of the electric system, they put their lives at risk as well as cause disruptive power outages and costly repairs – as experienced at the East Manhattan Substation, 921 Levee Drive, where wildlife caused several power outages over the summer. Westar is beefing up its wildlife protection measures at substations more prone to wildlife intrusions to help keep customers’ lights on, protect equipment and help keep wildlife safe from danger. Starting this week, Westar will be installing a product called Greenjacket from Cantega Technologies at the East Manhattan Substation. Greenjacket products are custom designed to precisely fit each piece of equipment, providing a better shield for the equipment and reducing the likelihood of wildlife contact. 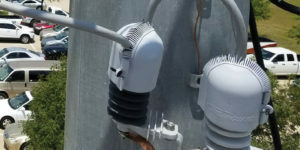 The product can also be installed on energized equipment, reducing the likelihood of a power outage during installation. Greenjacket covers are dark green and usually visible from outside of the substation. Current deterrents used at substations include metal guards to help protect key pieces of equipment from wildlife contact. However, in some cases, the guards do not provide enough cover. Special fencing is used to cover the lower perimeter of some substation fences preventing snakes from slithering through the fence. Even with these precautions, wildlife-related outages may still occur. Westar Energy, Inc. (NYSE: WR) is Kansas’ largest electric utility. For more than a century, we have provided Kansans the safe, reliable electricity needed to power their businesses and homes. Every day our team of professionals takes on projects to generate and deliver electricity, protect the environment and provide excellent service to our nearly 700,000 customers. Westar has 7,200 MW of electric generation capacity fueled by coal, uranium, natural gas, wind and landfill gas. We are also a leader in electric transmission in Kansas. Our innovative customer service programs include mobile-enabled customer care, a smart meter pilot project and paving the way for electric vehicle adoption. Our employees live, volunteer and work in the communities we serve. For more information about Westar Energy, visit us on the Internet at http://www.WestarEnergy.com.